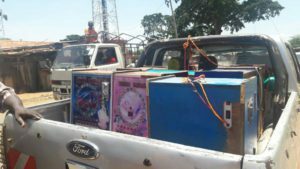 In its campaign to eliminate unregistered betting businesses, the National Lotteries and Gaming Regulatory Board this morning impounded illegal machines and closed several premised across the country. The board in close partnership with the police launched its operations in Lira, Mbale, Luweero, Mpigi and Hoima districts. Other districts are Kumi, Mityana, Kasese, Kanungu and Masindi. The board enforcement team has divided itself into seven groups to enable them cover up the entire country. “The exercise is part of the continuous countrywide compliance enforcement exercise. We are operating everywhere now,” said Jonathan Kyeyune, the board’s head of Public and Corporate Affairs. He said teams are blocking illegal operators and none compliant operators as they traverse the country. “We are considering all compliance issues including licenses, security, display of notices, premises hygiene, operational hours among others,” he explained. Last month, the board and the police closed Bellagio Casino in Entebbe for illegally operating without a license. The operations were also conducted in Kampala city and its neighbouring districts of Mukono, Wakiso and Mpigi. Kyeyune said they impounded more than 700 illegal slot machines in the city suburbs during the operation. The operation follows the expiry of the 60-day amnesty the board gave to illegal operators. Kyeyune said most of the confiscated machines were stationed in ungazatted areas and were confiscated together with the ware houses where they had been assembled. Justifying the closure of the premises, Kyeyune said some of them were unlicensed operators and others were allowing individuals below 25 years to enter their premises. With few days remaining for the schools to reopen for the final term, Kyeyune said they have to close illegal betting centres to protect school- going children from its negative effects. Gaming and betting business is regulated by the law. In 2016, Parliament tasked the body with the duty of enforcing the law.